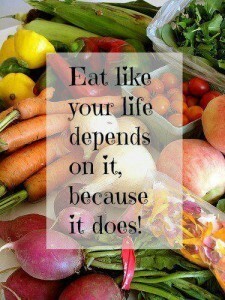 We’re all exposed to toxins on a daily basis. From water, food, environment, beauty and personal products to stress and negative thinking, toxins accumulate in our body. The good news is that our body innately detoxifies these substances. However, the exposure of these poisonous substances has dramatically increased over the year and our bodies need some extra help to stay healthy. The following are 5 simple ways to help your body detoxify on a daily basis. WAKE UP & ALKALIZE ~ while we sleep our body detoxifies and hence when we wake up we’re more acidic. By alkalizing your body, you will be starting your day on a positive note. When you wake up and before get up and out of bed, state (out loud or silently in your mind) at least 5 things you’re grateful for (positive thoughts alkalize your body). When you get up drink a large cup of warm water with lemon (squeeze in the juice from 1/2 lemon). If you’re a coffee drinker, consider drinking it later in the morning, once you’ve alkalized your body, instead of first thing, when you’re more acidic. HYDRATE ~ most people are dehydrated and this makes the detoxifying process that your body undergoes on a daily basis, very difficult. By drinking adequate amount of filtered water daily, you will increase your metabolism and help digestion, thereby allowing food to digest more easily and get rid of waste quicker. By staying well hydrated you will have more energy! Dehydration contributes to headaches, fatigue and sugar cravings. You will also be taking care of your liver, (liver is one of the most important organs of detoxification and works very hard to get rid of the daily toxins we’re exposed to), as water assists liver’s metabolism of fat. Water also helps to prevent muscle cramps and it helps to keep your joints lubricated allowing you to work out longer and pain-free. Carry a large water bottle with you, filled with filtered water with a large squeeze of fresh lemon juice and sip throughout the day. MOVE YOUR BODY ~ this includes what we commonly think of as exercise ~ running, weight training, brisk walking, cycling, as well as internal exercise including breath work (deep breathing exercises and yoga ~ this allows more toxins to exit the lungs with every exhalation and with every muscular contraction, transport toxins to lymph and blood), rebounding (jumping on a mini trampoline), swimming, dancing ~ all these exercises stimulate and move the lymph (the clear fluid, lymphocytes, that runs parallel to veins and delivers nutrients, collects cellular waste and helps destroy pathogens), allowing stagnant toxins to move out of the body in a simple, quick and efficient manner. CONSUME LIQUID SUNSHINE ~ eat more chlorophyll rich foods including wheatgrass juice, spirulina, chlorella, green juices & smoothies, leafy greens (kale, spinach, collard greens, bok choy, Swiss chard, parsley, cilantro, Romaine lettuce). Chlorophyll neutralizes toxins and carcinogens in the body. A molecule of chlorophyll closely resembles a molecule of human blood so if you’re feeling anaemic or tired, drinking a wheatgrass or spirulina shot, a glass of green juice or smoothie, or adding a few drops of liquid chlorophyll to your water, will cleanse and energize you! Chlorophyll is also an internal deodorizer. ADD & SWAP ~ add more alkaline forming foods into your daily diet including nutrient-dense superfoods, including chia seeds, hemp seeds, flax seeds, Goji berries, spirulina and chlorella. Fresh green vegetables (especially dark leafy greens) and raw fruits & a variety of vegetables all of which are healing, nourishing and satisfying. Swap the white, processed food-like-products (white sugar, flour), fried foods, caffeine, alcohol, wheat products, artificial sweeteners, colours, additives, processed soy and anything with an ingredient you cannot pronounce or ingredient that has a number. Our blood is alkaline (pH = 7.35), therefore by consuming more alkalizing foods and less acidifying ones, processed food products, we help the pathways of detoxification to clear our toxins more efficiently and keep us vital, radiant, strong and full of life.